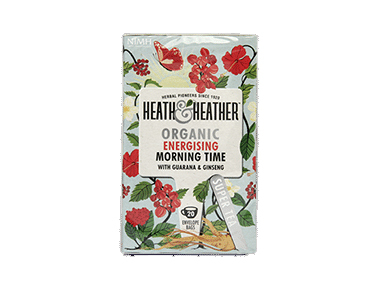 Buy Heath & Heather Morning Time Tea - 20 bags in the UK from our online shop or directly from our independent Scottish store. This lovely fruity infusion morning vitality with ginseng root and guarana. We sell real Heath & Heather and other Herbal Teas directly from our shop in Scotland and online throughout the UK. View more products from Heath & Heather. Where can you buy real Morning Time Tea - 20 bags safely online? If you are wondering where you can buy Heath & Heather Morning Time Tea - 20 bags safely online in the UK, then shop with us. Morning Time Tea - 20 bags - Heath & Heather Morning Time Tea - 20 bags in Herbal Teas and Tea Loose & Bags.